Some couples like to run together for exercise. Others will tackle a marathon or two together. Jacqueline Windh and Dave Gilbert of Port Alberni take their mutual love of running to the extreme: they are ultramarathoners. An ultramarathon is any race longer than a marathon, which is 42.2 kilometres (26 miles). Ultra distances start at 50 kilometres, and there are standards of 50 miles (80 kms), 100 kms, 100 miles and even 200 miles, says Windh. 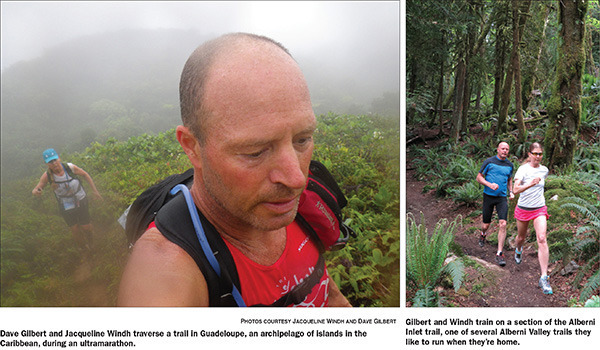 Windh and Gilbert have competed and participated in ultraruns around the world. “Ultrarunning is one of the fastest-growing sports in North America right now,” says Windh. She and Gilbert, both 50, love the sport for the personal achievement as well as the adventure tourism aspect. “There are some places you can only get to on foot. Through my international ultramarathon races I have experienced places and people that almost no other tourist would be able to even get to,” she says. Another experience has stayed with her, from the third day of a five-day race she participated in Himalaya. The run started high on a ridge line that serves as the border between Nepal and India, with views of Mount Everest. The trail descended along steep rocky trails for hours, down into the valley, emerging at last in a remote jungle village. “It was great interacting with the women in these villages, and the kids,” she says. “The locals here only see foreigners one day a year, the day the racers run through their village. Windh got into ultramarathoning “in a strange way,” she says. A writer and photographer, she started reporting on endurance races in 2005. “I realized I’d get much better photos if I could run down the trails a way, instead of just hanging out at transition areas or aid stations and getting photos of runners on the roadside or in a parking lot,” she relates. Gilbert grew up in the Alberni Valley and has been running and mountain biking its trails since he was a teenager. He used to race Ironman triathlons (which combine swimming, cycling and running). “When we got together, just over three years ago, I got him off the road and onto the trails,” says Windh. Earlier this month Windh returned from Patagonia, in South America, where she completed a 70K race in 19 hours, winning her 50-plus age group and placing in the top half overall. The couple completed their first 50-miler at Sun Mountain, Wash., on the May long weekend in 12:02 hours. “I had problems with both my knee and my Achilles tendon which slowed me down so we walked the final 20K,” she said. They don’t normally participate in back-to-back races so close together because their bodies need the down time. “We probably do two or three ultramarathon races a year, plus maybe a couple of marathons or half-marathons,” says Windh. “But we also go to ultramarathon runs that are not races. A few years ago, we ran up to Della Falls and Love Lake and back in a day. 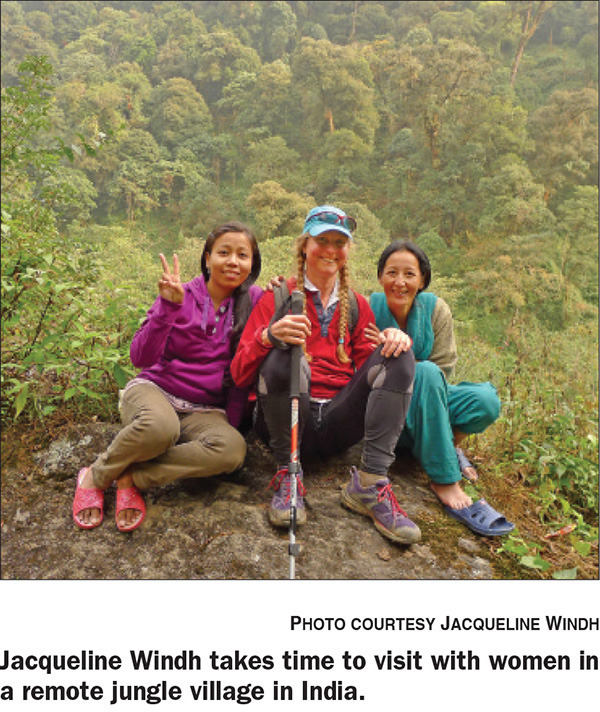 Last July I ran the Juan de Fuca Trail (47 kms) in a day, solo,” she says. Windh and Gilbert are avid trail runners and advocates for the trail system in the Alberni Valley. They can often be found running, hiking or walking the local trails for recreation, exercise or training. Gilbert is a board member for Vancouver Island Spine Trail Association (VISTA) and they both plan to attend the opening of the latest phase for the Inlet Trail on May 24. “We have the best trails—a pretty much unlimited network, if you count all the connections via the logging roads,” says Windh. “Many ultrarunners are at a disadvantage because they don’t have hills to train on where they live, but that is definitely not a problem here. And our trails are just so beautiful—Dave and I and the dog are on trails like Rogers Creek and the Inlet Trail several times a week. “Our popular running blog, www.daveandjackierun.wordpress.com, profiles Port Alberni’s trails as well as our international adventures, and has an ever-growing international readership—11,000 views last year and increasing,” says Windh. The couple will share a slideshow and stories about their ultramarathoning adventures on Tuesday, May 26 from 7–9 p.m. at Char’s Landing in Port Alberni. Tickets are $5. Their slideshow will feature photos from races they have done all over the world: Himalayas, Costa Rica, Patagonia, Guadeloupe, British Columbia and Washington State. “We will also talk about some of the crazy things you experience while running such long races—ranging from intense pain to exhilaration to hallucinations,” she says.